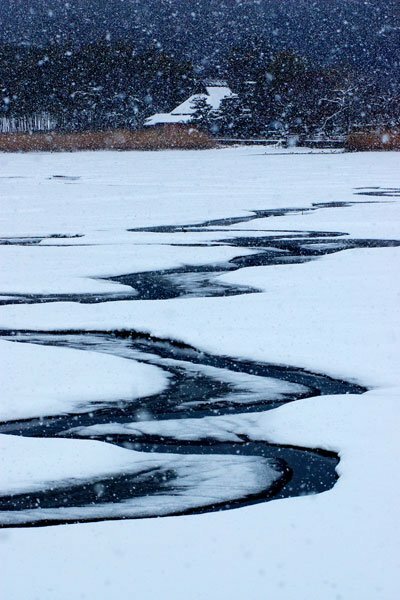 Hirosawa Pond in north Kyoto in deep winter mode . . .
Kachuan Seiho Museum: This museum was the early 20th-century villa of the influential 19th-century painter, Seiho Takeuchi, who painted some of the greatest works of animals and exquisite Japanese scenes of the past 100 years; who painted some of the greatest works of animals and exquisite Japanese scenes of the past 100 years. On Shin-Marutamachi, a little east of Arashiyama. Open 10:00-16:00 (enter by 15:00), closed Mon. Entry: ¥5,000 (including museum, garden, tea service and a superb all-color book of his paintings). Reservations required. Tel: 872-3100. Kyoto Station Building: Whatever its merits as a piece of architecture, Kyoto’s new station building is certainly a fun place to spend time. It has become the edge of Kyoto that most closely resembles the sophisticated multi-story elegance and variety that defines Tokyo. The fun way to go back down is via the giant stairs that run from the 4th to 11th floors, weaving your way through the cuddling couples and vacationing seniors. Or take a detour at the 10th floor, and take the skywalk that runs all the way to the other side of the station—neat views of the people passing below. Kyoto that most closely resembles the sophisticated multi-story elegance and variety that defines Tokyo. The fun way to go back down is via the giant stairs that run from the 4th to 11th floors, weaving your way through the cuddling couples and vacationing seniors. Kitashirakawa Natural Radium Onsen: Located on the scenic driveway to Mt. Hiei, the healing natural radium hot spring water of this spa is ranked as the best in the Kansai region. The 3rd-generation owner, Mr. Fujita, speaks English. Tel: 781-4525. Funaoka Spa & Bathhouse: Among the oldest extant bathhouses in Kyoto, Funaoka dates from the early 19th century. Of particular interest are the exquisite ranma (elaborate carved wood panels) which partition the changing rooms. Open daily 15:00-1:00 am. 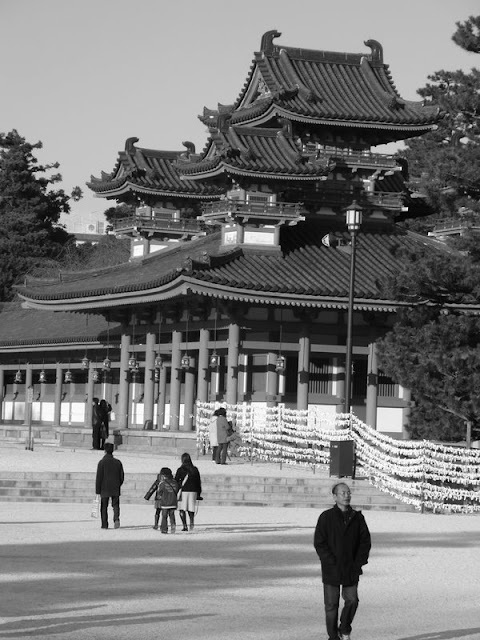 Located directly south and just a tiny bit west of Daitoku-ji Temple. Tel: 441-3735. Kurama Onsen: outdoor spa in Kurama (see page 7 map); 30-min. by train from Demachiyanagi Stn. Open 9:00-21:00, closed Mondays. Tel: 741-2131. Nizaemon no Yu: indoor and outdoor baths, restaurants, massage. Open 10:00-02:00 (from 08:00 on weekends). One km west of Hankyu Katsura Stn. Tel: 393-4500. Shomen-yu: This sento (just north of Sanjusangendo, east of Kyoto Station) is entirely modern and thus quite the experience. Three stories high, bathers change on the first floor and then ascend, by elevator, to the second floor where there are several large baths including a big whirlpool. There is also a large sauna on the 3rd floor, more pools and the added luxury of a wooden, outdoor hot tub. Open 16:00 - 11:30 pm, closed Tuesdays. Tel: 561-3232. Tokiwa-yu: One of several old-style sentos remaining in the Okazaki area (where the high number of old, tiny houses, many without bath, makes the local sento indispensable). Located 50 meters southwest of the entrance to Kurodani Temple. Open 16:00 - 23:30, closed Wednesdays. Tel: 771-5035. Here are some things many (especially older, i.e. wiser) Japanese make great use of in winter. Most of these things are sold in big department stores or in traditional neighborhood shopping arcades (shotengai). Nabe Hot Pots: in the winter months the Japanese love nothing more than cooking up all kinds of things in communal (like fondue) nabe pots. These sturdy, wide-more-than-deep ceramic pots are a great thing to take home. They are usually decorated with traditional seasonal motifs (often cherry blossoms: something to look forward to during the cold winter months). If you do get a nabe, you should get a portable gas burner so that you can place it on your table at home and the whole family or friends can eat together. Japanese Winter Hanten Coats & Vests: The Japanese don’t have central heating. Instead portable kerosene heaters are used in almost all homes and apartments. Blanket-covered heatlamp table (kotatsu) are also a winter favourite. But if you have to venture outside, into a cold room, or just want to stay extra warm, traditional padded (wonderfully patterned) hanten coats and vests are the way to go. Look good and be extra warm this winter: get a hanten at any department store Traditional Hot Water Bottles: getting into the cold futon on a bitter cold night is always a bit of a shock. That’s where a yutampo, hot water bottle (placed at the foot of the bed) comes in super handy. The old ones are not so common any more, but if you look real hard you should be able to find one (ask at local pharmacies; if they don’t have one they can tell you where to get one). Modern styles are widely available at big department stores). Content copyright of Your Japan Tours (www.kyoto-tokyo-private-tours.com): 30 years of expert Japan travel design and tour operator excellence.